Western Tyers River – Great for Crays! 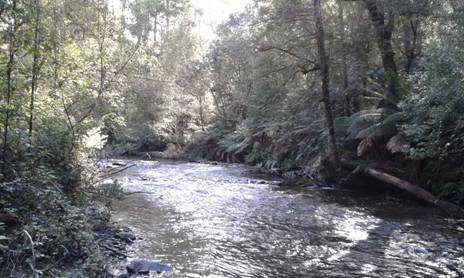 Escaping the heat: The Western Tyers is the BEST place I know to spend a couple of hot days: nestled under the South face of Mt Baw Baw, enclosed by Antarctic Beech and majestic Mountain Ash, it is always a lovely spot on such a day. 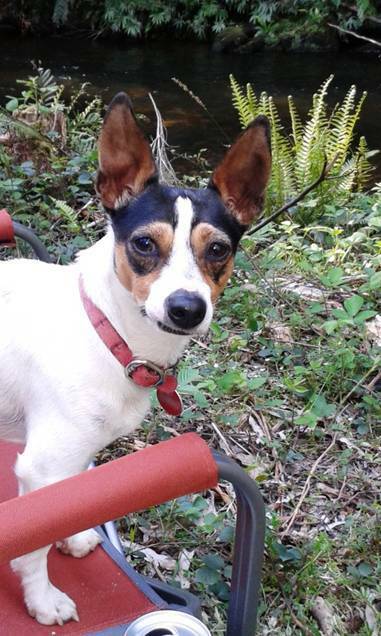 You can brave the icy water (if you dare) or just lounge around in the shade on a folding chair, betimes catching the odd spinyback crayfish or mountain trout – or a platypus if your fancy so takes you: the dogs bark at them but have so far failed to bag one. I have wondered how platypus tails would GO with lobster tails! To get there you head up the main road to Erica from Moe, take the Tanjil Bren turn-off just after Wild Cow Track, travel 13 km and turn right at the first track after the 13 km post (Palmers Track, not signposted) shortly after Beynons Creek Rd. Palmers Track is fine (but not after rain) for light SULs such as Subarus down to the river at the old Palmers Mill/Bridge sites where there are two campsites. The Western Tyers ROAD (!) along the river is now only suitable for real 4WDs, though 30 years ago when we discovered it lots of folks made it in Kingswoods! The Western Tyers Rd parallels the river for many kms usually less than 10 metres away. There are a number of pleasant unofficial campsites. 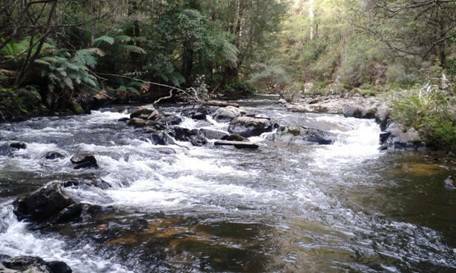 It IS possible to canoe the river from Growlers (possibly from Christmas Creek – another fine campsite) down to the old bridge at Western Tyers and I have done so many times years ago, though I doubt anyone else ever has. There is a spectacular (@ Grade 4) chute and drop just below Growlers where the old rail line diverged from the road. It is possible to walk around it. You can walk the old rail line down to Palmers (rough going nowadays) but you will catch many trout etc in that remote stretch of river. I planned once to clear the river for canoeing all the way from eg Growlers to the Morwell Pumping Station at Wirilda Park (off the Tyers-Yallourn North Rd). I have from time to time cleared sections of it and canoed others. I estimate it would produce a trip of around a week’s duration containing some superb fishing and some wonderful campsites – and so CLOSE! I did some work on a couple of the worst bog holes on the Western Tyers Rd (to make them navigable) and will do some more next time I am there, (soon I hope). The kids will want to come next time after they see the crays we brought home this time! 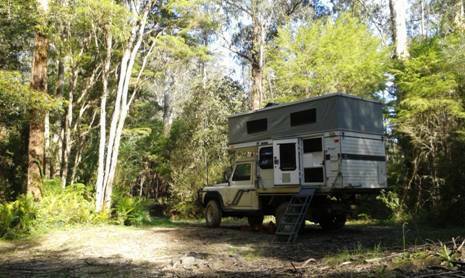 Our old camp on the Western Tyers. 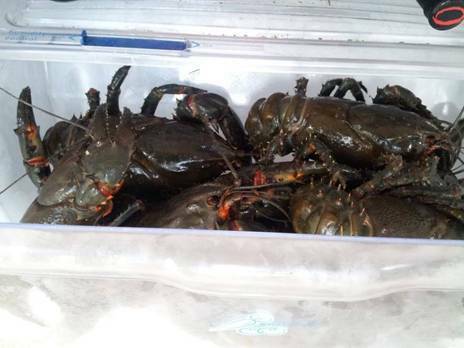 Our Crayfish haul safely back home in the fridge. I have not been able to beat Montbell for warmth/lightness. I will do a post about that. And about adding down to sleeping bags – which I am about to do. I find my -1C Montbell bag with a liner is fine for most winter occasions (down low). Sometimes I wear my down jacket on my upper body and my down vest on my lower. I have down socks (I never need them, but Della does). We both have insulated hats. Hers is down. Mine is Primaloft. Some of the tracks for the Upper Yarra Track winter route (I guess that’s what you mean) are too wet for most 2WD cars in the winter, but will be fine for walking. You can drive past Carringal to Western Tyers (gravel road – might be slippery in 2WD) and take a walk from there for a day trip. Just walk through the gate and continue on along the river road. Take a rod. If you have one of the urban 4WDs, slippery gravel roads are just what they are for. A set of snow chains or two will get you a long way. You just have to be sensible and careful. Some lovely walks around Tanjil Bren. accommodation at the Moose Lodge. Tar to Tanjil Bren, then walk. Lots of lovely places in Gippsland. Have you been to the Ada Tree? (2WD) You can walk along the river all the way back to Warburton (see Upper yarra Track Instructions). Winter will be fine for low down walks like that. Have fun. Good luck. Cheers, Steve. I am still getting so much out of reading your blog – thank you so much for sharing with us all. I have never been to this area, but as it is close (to Eastern suburbs), it sounds very inviting for taking a relaxing weekend, camping and exploring over Summer. Thank you Jenny. Gippsland is way the best part of Australia. No need to wait for summer to visit. There are many wonders all year round. I am hoping to get away for a few days over the next week or so to camp along one of our great rivers – at only 300 metres above sea level and with ample firewood and winter temperatures at night rarely below freezing, yet often beautiful days winter is a great time to visit. Many people even canoe mostly in winter as there is more water then (they wear a wet suit). Good luck with your explorations. Cheers, Steve. A few years back myself and two mates kayaked this river. We figured it would be too thick up higher so put in at W12 track and ended at Wirilda Park. We paddled it with no expectations and came off the river with smiles all round. Some nice rapids, clear clean water and no real hazards to speak of. Will get back on it one day. Maybe try the upper reaches of this river.